This site provides primary care clinicians with medical audit tools to assess and improve the management of their patients. Audit results are displayed in anonymous manner, in the format of a benchmark - both compared with others and also showing personal change over time. This website provides a system for health professionals to participate in medical audit, and has been developed by Dr Mark L Levy, who has had nearly 30 years of participating in and designing medical audits. This website should be of benefit to individual as well as groups of primary care practitioners, whether they are based at a single site or are sessional or freelancers. The reports summarizing the audit results, if included as part of a professional Personal Development Plan, could provide evidence of medical audit (and action taken as a result) for the purpose of annual appraisal and revalidation requirements in the future. Commissioning bodies and providers could also benefit from the process, by completing repeated audit cycles (ie data collection, evaluation of reports, intervention and re-audit) through reduction in unplanned hospital referral and admission. 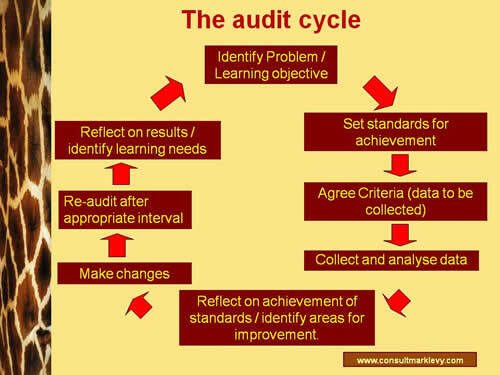 The diagram below illustrates the processes involved in performing a medical audit cycle. At present the system on this website provides for a single part of the audit cycle and therefore please do a baseline audit and then, if you do want to repeat an audit at a later stage, please contact Dr Mark Levy for instructions so that the repeat audit (at completion of the cycle) can be compared with the earlier baseline audit. Medical audit is a proven method for experiential learning, and for health professionals to improve both the process and the quality of care for their patients. The unique feature of this website system for audit is the provision of immediate feedback, after each new audit result is entered online, comparing an individual clinicians' changes in care over time as well as with that provided by of other clinicians world wide. The data are all anonymised, and only registered users, with passwords, will be able to see their own data for comparison with others. Unregistered users will be able to see the amalgamated data for everyone, without individual comparison. I look forward to welcoming you to the site if you do decide to enroll on any of the audits available.